That’s a little puzzle from this book, a light-hearted yet brain-bending cornucopia of philosophical and logical tidbits. It all flows like a rambling monologue from a brilliant and eccentric professor, full of curious facts and ideas. Add a second pill from the A bottle. Cut each of the four pills in half. Take one half of each pill. That will be equivalent to taking 1 A pill and 1 B pill. Tomorrow, consume the remaining halves. Then return to your normal regime. Sorensen doesn’t just stop with giving the answers: some of them lead to further questions, explanations or explorations of the topic. It’s all thoroughly absorbing. I have sought out and read books like this my whole life, so by now I’m often familiar with most of the items. But this book was like a voyage of discovery: almost every item was new to me. I enjoyed it so much that I had to ration the pages so it would last longer. 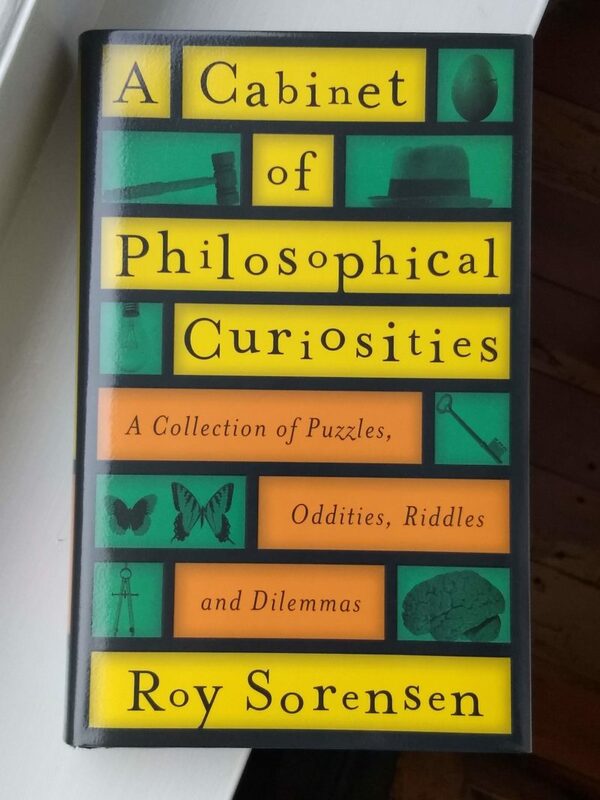 This review is about books, logic, philosophy, puzzles, Roy Sorensen. Bookmark the permalink.